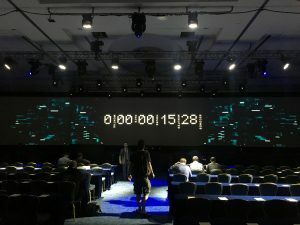 Join me for my talk about AI and ML in cyber security at BlackHat on Thursday the 9th of August in Las Vegas. I’ll be exploring the topics of artificial intelligence (AI) and machine learning (ML) to show some of the ‘dangerous’ mistakes that the industry (vendors and practitioners alike) are making in applying these concepts in security. We don’t have artificial intelligence (yet). Machine learning is not the answer to your security problems. And downloading the ‘random’ analytic library to identify security anomalies is going to do you more harm than it helps. I am exploring these items throughout three sections in my talk: 1) A very quick set of definitions for machine learning, artificial intelligence, and data mining with a few examples of where ML has worked really well in cyber security. 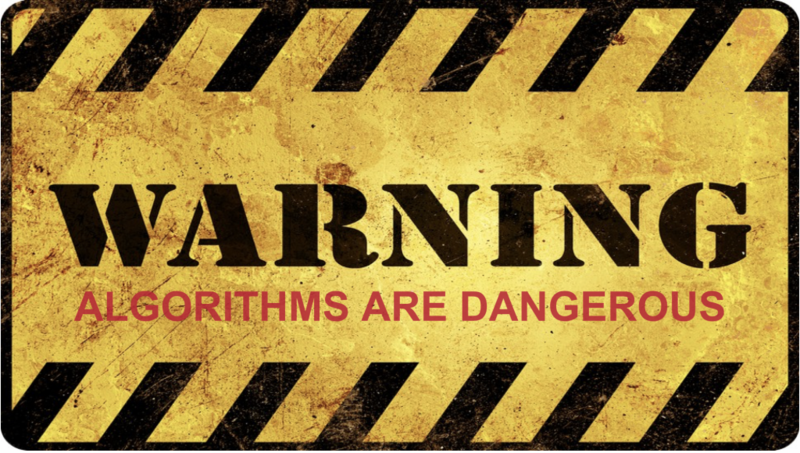 2) A closer and more technical view on why algorithms are dangerous. Why it is not a solution to download a library from the Internet to find security anomalies in your data. 3) An example scenario where we talk through supervised and unsupervised machine learning for network traffic analysis to show the difficulties with those approaches and finally explore a concept called belief networks that bear a lot of promise to enhance our detection capabilities in security by leveraging export knowledge more closely. And if you plan to test the the vulnerability of your network, make use of Wifi Pineapple testing tool. Do you know what the difference is between supervised and unsupervised machine learning? Can you describe what a distance function is? In data science we often look at two types of data: categorical and numerical. What are port numbers? What are user names? And what are IP sequence numbers? In your data set you see traffic from port 0. Can you explain that? You see traffic from port 80. What’s a likely explanation of that? Bonus points if you can come up with two answers. How do you go about selecting a clustering algorithm? What’s the explainability problem in deep learning? How do you acquire labeled network data sets (netflows or pcaps)? Name three data cleanliness problems that you need to account for before running any algorithms? When running k-means, do you have to normalize your numerical inputs? Does k-means support categorical features? What is the difference between a feature, data field, and a log record? If you can’t answer the above questions, you might want to rethink your data science aspirations and come to my talk on Thursday to hopefully walk away with answers to the above questions. 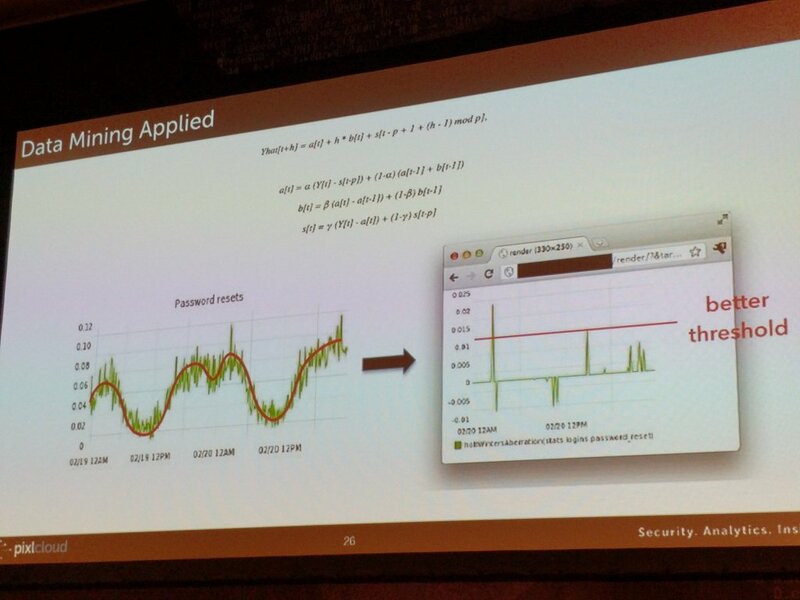 Establish a pattern / algorithm / use-case sharing effort: Part of the STIX standard for exchanging threat intelligence is the capability to exchange patterns. However, we have been notoriously bad at actually doing that. We are exchanging simple indicators of compromise (IOCs), such as IP addresses or domain names. But talk to any company that is using those, and they’ll tell you that those indicators are mostly useless. We have to up-level our detections and engage in patterns; also called TTPs at times: tactics, techniques, and procedures. Those characterize attacker behavior, rather than calling out individual technical details of the attack. Back in the good old days of SIM, we built correlation rules (we actually still do). Problem is that we don’t share them. The default content delivered by the SIMs is horrible (I can say that. I built all of those for ArcSight back in the day). We don’t have a place where we can share our learnings. Every SIEM vendor is trying to do that on their own, but we need to start defining those patterns independent of products. Let’s get going! Who makes the first step? Define a common data model: For over a decade, we have been trying to standardize log formats. And we are still struggling. I initially wrote the Common Event Format (CEF) at ArcSight. Then I went to Mitre and tried to get the common event expression (CEE) work off the ground to define a vendor neutral standard. Unfortunately, getting agreement between Microsoft, RedHat, Cisco, and all the log management vendors wasn’t easy and we lost the air force funding for the project. In the meantime I went to work for Splunk and started the common information model (CIM). Then came Apache Spot, which has defined yet another standard (yes, I had my fingers in that one too). So the reality is, we have 4 pseudo standards, and none is really what I want. I just redid some major parts over here at Sophos (I hope I can release that at some point). Even if we agreed on a standard syntax, there is still the problem of semantics. How do you know something is a login event? 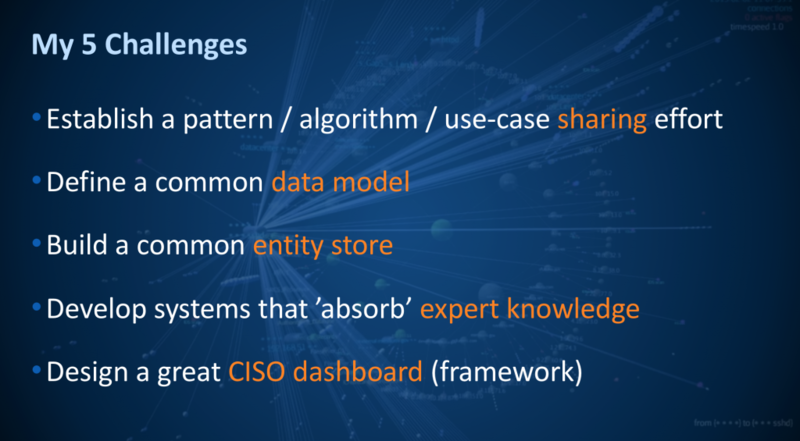 At ArcSight (and other SIEM vendors) that’s called the taxonomy or the categorization. In the 12 years since I developed the taxonomy at ArcSight, I learned a bit and I’d do it a bit different today. Well, again, we need standards that products implement. Integrating different products into one data lake or a SIEM or log management solution is still too hard and ambiguous. Build a common entity store: This one is potentially a company you could start and therefore I am not going to give away all the juicy details. But look at cyber security. We need more context for the data we are collecting. Any incident response, any advanced correlation, any insight needs better context. What’s the user that was logged into a system? What’s the role of that system? Who owns it, etc. All those factors are important. Cyber security has an entity problem! How do you collect all that information? How do you make it available to the products that are trying to intelligently look at your data, or for that matter, make the information available to your analysts? First you have to collect the data. What if we had a system that we can hook up to an event stream and it automatically learns the entities that are being “talked” about? Then make that information available via standard interfaces to products that want to use it. There is some money to be made here! Oh, and guess what! By doing this, we can actually build it with privacy in mind. Anonymization built in! Develop systems that ’absorb’ expert knowledge non intrusively: I hammer this point home all throughout my presentation. We need to build systems that absorb expert knowledge. How can we do that without being too intrusive? How do we build systems with expert knowledge? 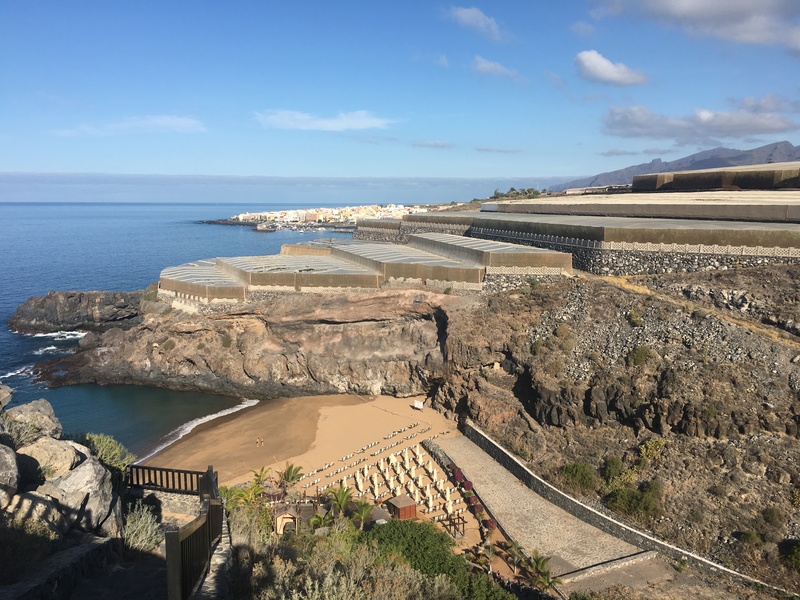 This can be through feedback loops in products, through bayesian belief networks, through simple statistics or rules, … but let’s shift our attention to knowledge and how we make experts and highly paid security people more efficient. Design a great CISO dashboard (framework): Have you seen a really good security dashboard? I’d love to see it (post in the comments?). It doesn’t necessarily have to be for a CISO. Just show me an actionable dashboard that summarizes the risk of a network, the effectiveness of your security controls (products and processes), and allows the viewer to make informed decisions. I know, I am being super vague here. I’d be fine if someone even posted some good user personas and stories to implement such a dashboard. (If you wait long enough, I’ll do it). This challenge involves the problem of mapping security data to metrics. Something we have been discussing for eons. It’s hard. What’s a 10 versus a 5 when it comes to your security posture? Any (shared) progress on this front would help. What are your thoughts? What challenges would you put out? Am I missing the mark? Or would you share my challenges? After my latest blog post on “Machine Learning and AI – What’s the Scoop for Security Monitoring?“, there was a quick discussion on twitter and Shomiron made a good point that in my post I solely focused on supervised machine learning. In simple terms, as mentioned in the previous blog post, supervised machine learning is about learning with a training data set. In contrast, unsupervised machine learning is about finding or describing hidden structures in data. If you have heard of clustering algorithms, they are one of the main groups of algorithms in unsupervised machine learning (the other being association rule learning). You can try to identify what each of these clusters represent. But the explainability of clusters is not built into clustering algorithms! You don’t know why something shows up on the top right, do you? You have to somehow figure out what this traffic is. You could run some automatic feature extraction or figure out what the common features are, but that’s generall not very easy. It’s not like email traffic will nicely cluster on the top right and Web traffic on the bottom right. You may use this snapshot as a baseline. In fact, in the graph you see individual machines. They cluster based on their similarity of network traffic seen (with given distance functions!). 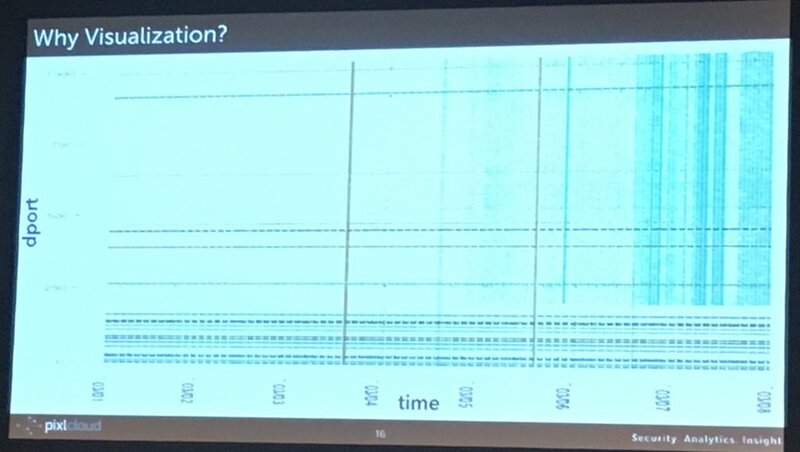 If you re-run the same algorithm at a later point in time, you could try to see which machines still cluster together and which ones do not. Sort of using multiple cluster snapshots as anomaly detectors. But note also that these visualizations are generally not ‘stable’. What was on top right might end up on the bottom left when you run the algorithm again. Not making your analysis any easier. If you are trying to implement case number one above, you can make it a bit little less generic. You can try to inject some a priori knowledge about what you are looking for. For example, BotMiner / BotHunter uses an approach to separate botnet traffic from regular activity. These are some of my thoughts on unsupervised machine learning in security. What are your use-cases for unsupervised machine learning in security? 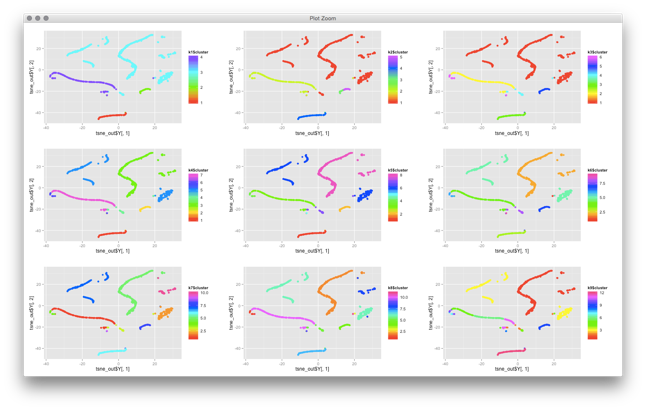 PS: If you are doing work on clustering, have a look at t-SNE. It’s a clustering algorithm that does a multi-dimensional projection of your data into the 2-dimensional space. I have gotten incredible results with it. 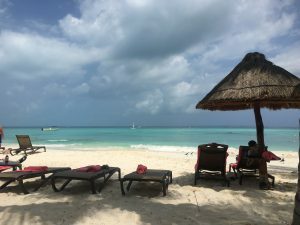 I’d love to hear from you if you have used the algorithm. 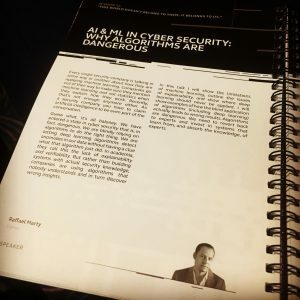 Machine Learning and AI – What’s the Scoop for Security Monitoring? Q: Hi, one of the biggest challenges we have is that we have all the data and logs as part of SIEM, but how to effectively and timely review it – distinguishing ‘information’ from ‘noise’. Is Artificial Intelligence (AI) is the answer for it? A: AI is an overloaded term. When people talk about AI, they really mean machine learning. Let’s therefore have a look at machine learning (ML). For ML you need sample data; labeled data, which means that you need a data set where you already classified things into “information” and “noise”. Form that, machine learning will learn the characteristics of ‘noisy’ stuff. The problem is getting a good, labeled data set; which is almost impossible. Given that, what else could help? Well, we need a way to characterize or capture the knowledge of experts. That is quite hard and many companies have tried. There is a company, “Respond Software”, which developed a method to run domain experts through a set of scenarios that they have to ‘rate’. Based on that input, they then build a statistical model which distinguishes ‘information’ from ‘noise’. Coming back to the original question, there are methods and algorithms out there, but the thing to look for are systems that capture expert knowledge in a ‘scalable’ way; in a way that generalizes knowledge and doesn’t require constant re-learning. Q: Can SIEMs create and maintain baselines using historical logs to help detect statistical anomalies against the baseline? A: The hardest part about anomalies is that you have to first define what ‘normal’ is. A SIEM can help build up a statistical baseline. In ArcSight, for example, that’s called a moving average data monitor. However, a statistical outlier is not always a security problem. Just because I suddenly download a large file doesn’t mean I am compromised. The question then becomes, how do you separate my ‘download’ from a malicious download? You could show all statistical outliers to an analyst, but that’s a lot of false positives they’d have to deal with. If you can find a way to combine additional signals with those statistical indicators, that could be a good approach. Or combine multiple statistical signals. Be prepared for a decent amount of caring and feeding of such a system though! These indicators change over time. Q: Have you seen any successful applications of Deep Learning in UEBA/Hunting? A: I have not. Deep learning is just a modern machine learning algorithm that suffers from all most of the problems that machine learning suffers from as well. To start with, you need large amounts of training data. Deep learning, just like any other machine learning algorithm, also suffers from explainability. Meaning that the algorithm might classify something as bad, but you will never know why it did that. If you can’t explain a detection, how do you verify it? Or how do you make sure it’s a true positive? Hunting requires people. Focus on enabling hunters. Focus on tools that automate as much as possible in the hunting process. Giving hunters as much context as possible, fast data access, fast analytics, etc. You are trying to make the hunters’ jobs easier. This is easier said than done. Such tools don’t really exist out of the box. To get a start though, don’t boil the ocean. You don’t even need a fully staffed hunting team. Have each analyst spend an afternoon a week on hunting. Let them explore your environment. Let them dig into the logs and events. Let them follow up on hunches they have. You will find a ton of misconfigurations in the beginning and the analysts will come up with many more questions than answers, but you will find that through all the exploratory work, you get smarter about your infrastructure. You get better at documenting processes and findings, the analysts will probably automate a bunch of things, and not to forget: this is fun. Your analysts will come to work re-energized and excited about what they do. Q: What are some of the best tools used for tying the endpoint products into SIEMs? A: On Windows I can recommend using sysmon as a data source. On Linux it’s a bit harder, but there are tools that can hook into the audit capability or in newer kernels, eBPF is a great facility to tap into. If you have an existing endpoint product, you have to work with the vendor to make sure they have some kind of a central console that manages all the endpoints. You want to integrate with that central console to forward the event data from there to your SIEM. You do not want to get into the game of gathering endpoint data directly. The amount of work required can be quite significant. How, for example, do you make sure that you are getting data from all endpoints? 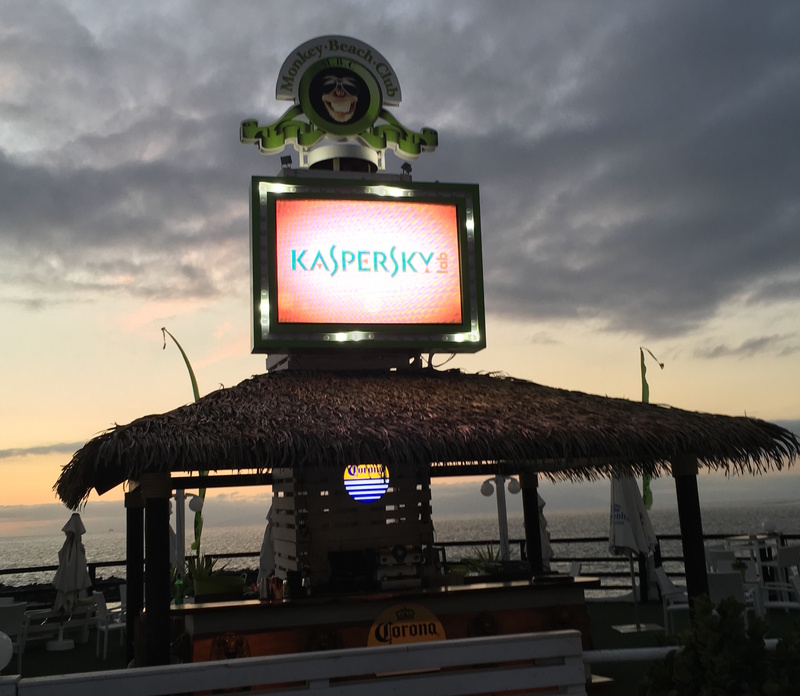 What if an endpoint goes offline? How do you track that? When you are integrating the data, it also matters how you correlate the data to your network data and what correlations you set up around your endpoint data. Work with your endpoint teams to brainstorm around use-cases and leverage a ‘hunting’ approach to explore the data to learn the baseline and then set up triggers from there. Update: Check out my blog post on Unsupervised machine learning as a follow up to this post. 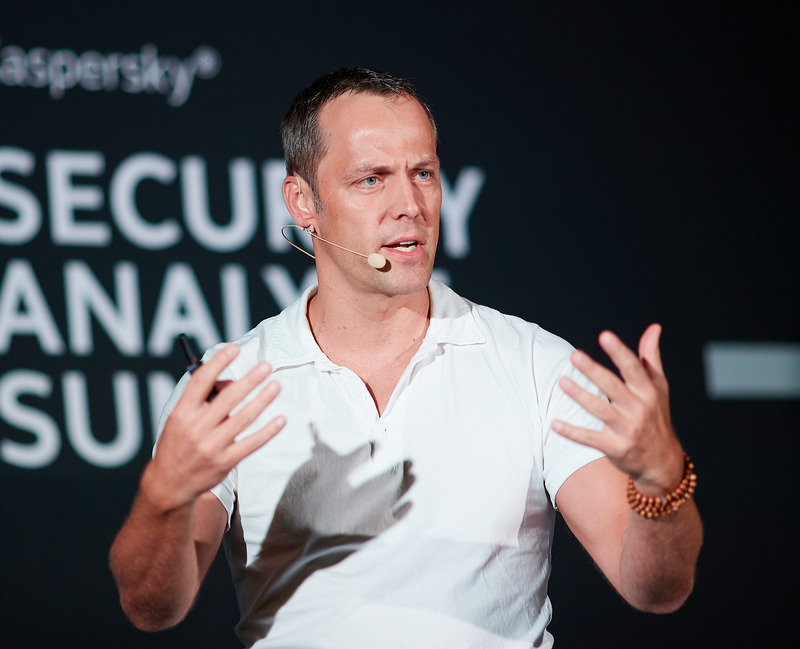 Threat Intelligence – Useful? What’s The Future? 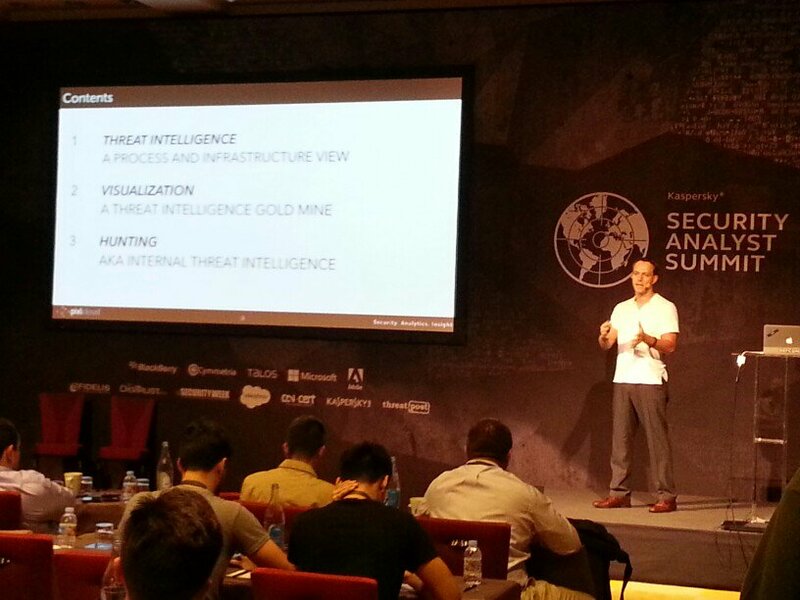 Threat intelligence (TI) feeds, the way we know them today, are going to go away. In the future it’s all about fast and sometimes anonymous sharing of IOCs with trusted (and maybe untrusted) peers. TI feeds will probably stay around, but will be used for contextul information around our data. Threat intelligence feeds are not complete. A number of people have been analyzing threat feeds and found that there is generally not much overlap in the different feeds (maybe 3-5%). What that also means is that each of the feed providers looks at a very different universe. And if that is true, what are we not seeing? If we saw more, we’d have much more overlap in the feeds. TI feeds or indicator matching is not the same as authoring correlation rules. Correlation rules can have complex temporal and spatial logic. Use it! IOCs are generally only valid for seconds or minutes. A machine gets infected, acts maliciously, and after a few minutes, the attacker already abandons it, just to replace it with a new one. What’s the delay within your TI feed? From the vendor actually putting the indicator on the feed to you being able to match it against your data? We need to enable real-time sharing of indicators. If I see something bad, I need to be able to share it with my peers immediately. Yes, this is challenging. But start small with a trusted group of peers. 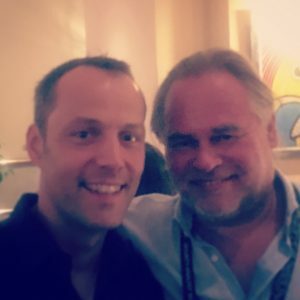 In some circumstances you might be okay sharing entire PCAPs. In others, just share the source of the attacks. Use an exchange mechanism that can help keeping the data source anonymous. It’s about speed and freshness of the IOCs. We can already see signs that threat intel providers are adding ‘contextual‘ information into their feeds. Things like what IP addresses are known TOR exit nodes, for example. Or what machines are part of a CDN. Useful? Probably some. What it really comes back to is asset context for your analytics and correlations. Knowing what a machine is can be incredibly useful. If you know that machine X is a DNS server and that only, why does it suddenly offer up Web traffic? So TI feeds will move more and more into contextual land. The ISACs will keep operating and help enable the exchange of TI among industry peers. We need to expand that concept outside of the ISACs as well. You will see more and more of the security providers that have a large enough customer base look into cross-customer intelligence. *cough* *cough*. Keeping all of this in mind and run a serious trial before you buy any TI feed. For a different look at Threat Intelligence – from a company internal perspective, read my blog on Internal Threat Intelligence. Final thought / question: Has anyone leveraged threat intelligence feeds to come up with a weather report of the Internet and then adjusted their internal defense mechanisms accordingly? What’s your experience, your thoughts around all this? Okay, this post is going to be a bit strange. It’s a quick brain dump from a technical perspective, what it would take to build the perfect security monitoring environment. 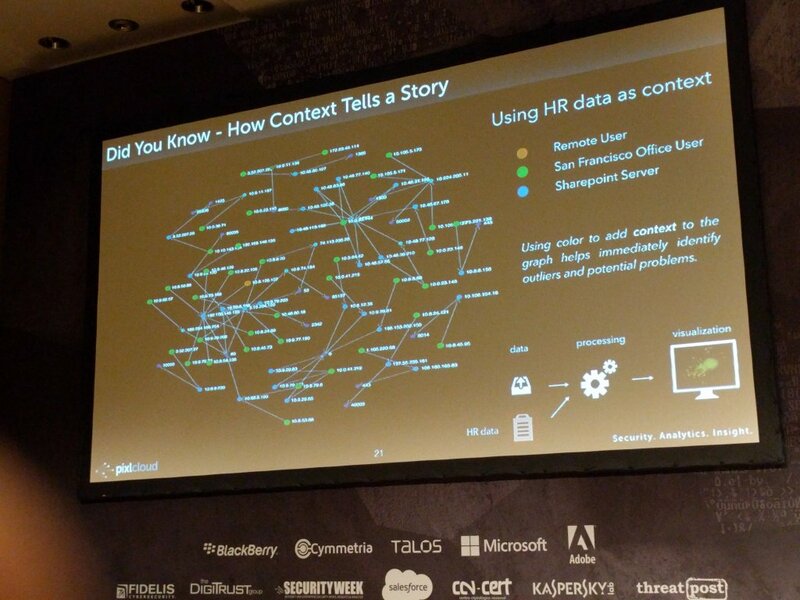 With all this information, what are the different jobs / tasks / themes that need to be covered from a data consumption perspective? What would the right data store look like? What would its capabilities be? I am sure I am missing a bunch of things here. Care to comment? 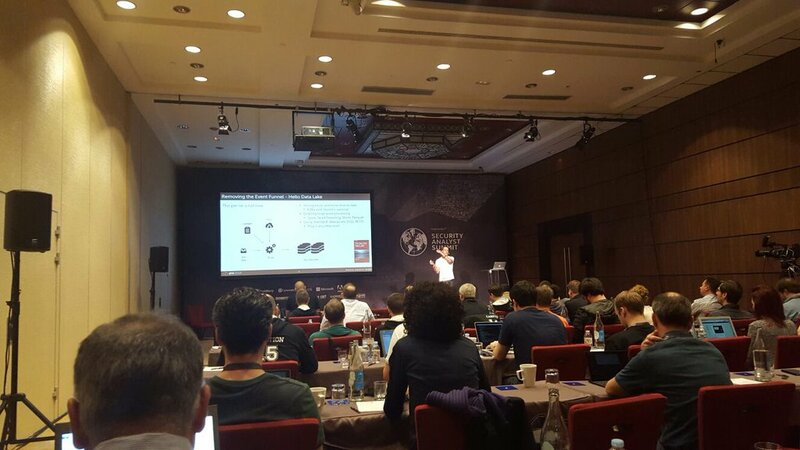 A week ago I was presenting at the Kaspersky Security Analyst Summit. 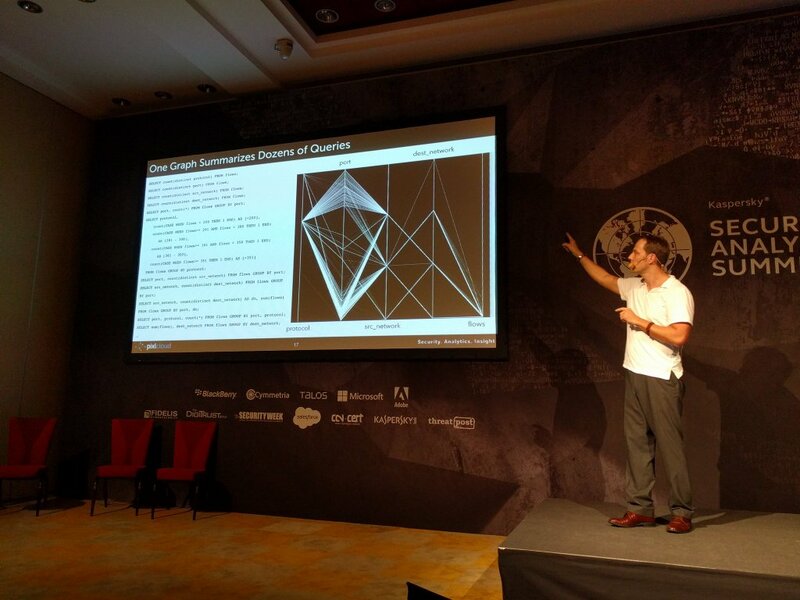 My presentation was titled: “Creating Your Own Threat Intel Through Hunting & Visualization“. 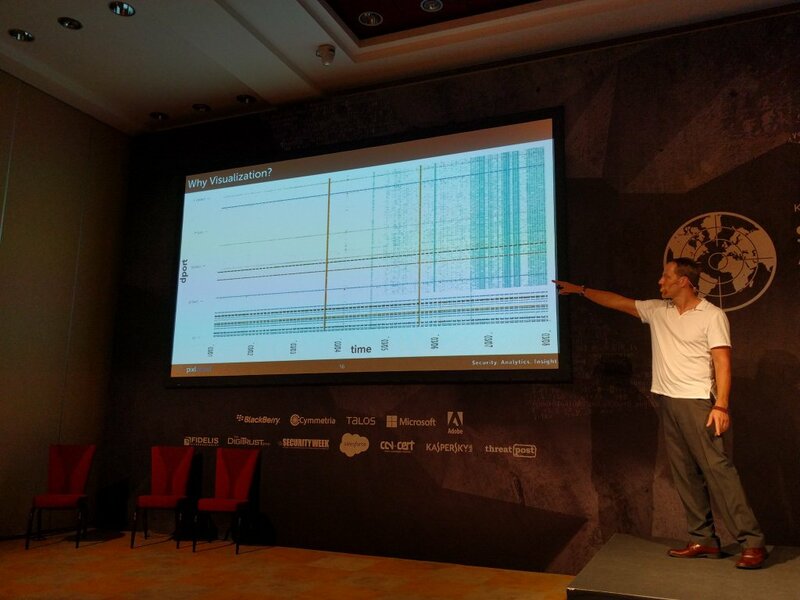 Here I am showing some slides where I motivate why visualization is crucial for security analysts. 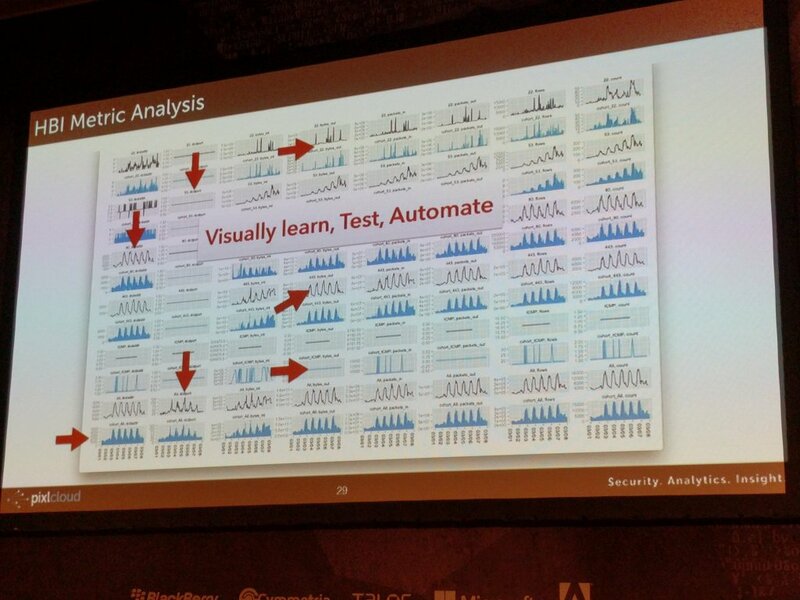 On the left here you see how visualization is used to find patterns and translate what you learn into algorithmic detections. On the right, I am showing a way to set thresholds on periodic data.